So, now that I've worked out the details, I am happy to announce that ANP is now official! Check out Chapter 1 here, and stay tuned to that topic for more chapters! As of right now, we are doing casting for the main characters of the first book, Tale of the Toa. I (Joev14), will be directing the series, as well as being the narrator for all non-dialogue portions of the book. Eljay will be assistant director. Below is a list of the characters for Tale of the Toa. Casting for Book 1 is finished, but please check below for a list of books 2-5 characters you can audition for! Roles for future books are still open! If you are interested in playing a character, send me a PM with a list of the characters you'd like to audition for (There is no limit to the number of characters you audition for, or how many you can voice, keep in mind though that it is likely only character role will be given to each person). If you are given a part, you are committing yourself to that role for the book, and for some main characters, all five books of Chronicles. If there is a character you'd like to audition for that shows up in a later book of Chronicles, feel free to shoot me a PM, I'm willing to hear auditions for future characters as well. Here is the Format in which you should send your Audition Request. Skype and Audacity will be required in order to get a main role. Some of the minor roles might only require a recording program (like Audacity). Edited by joev14, Sep 29 2015 - 08:06 PM. Eljay has been cast for the role of Lewa, and will also be my assistant director. I assume you'll be adding music as well? Edited by joev14, Aug 28 2014 - 11:15 AM. Very cool. 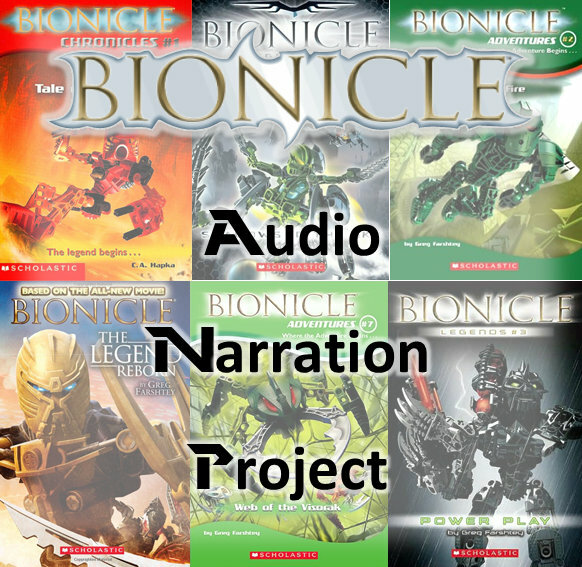 I did a audiobook of some of the bionicle serials back in the day, and that was quite fun. I'll be more than happy to audition for a part. I'll send you a PM about that. However, I do want to just warn you. One of the reason I never did the actual books was fear of copyright, or a C&D order. While my guess is that these books have been long out of print at this point that it may not really matter anymore, you may want to take the time and contact Lego (assuming you havn't already done so) and get permission. Or you can just do it and hope they turn a blind eye. Either way, its up to you. Anyway, I'll send you a PM. Auditions Acceptance for Chronicles: Tale of the Toa will be closing at 11:59 on Wednesday, Sept. 3rd Central Standard Time. Please get your forms sent in! EDIT: If you have already PMed me with your skype name, you are already on the auditions list. EDIT2: If you'd like to audition for characters in a future book, feel free to send me a PM as well! Edited by joev14, Sep 03 2014 - 01:24 AM. Awesome! Can't wait to get it started! The only remaining roles necessary to be filled are Whenua, Onepu, and Gali. If you're interested, send in auditions forms to me via PM, thanks! I am so excited this is happening! I'm so pumped to work with all of you! Perhaps a future book, then. Ah, Onua, far from my favorite, but I'll gladly take it. Hanray will be voicing Gali! Additional Notice: We will hopefully have a Trailer out within the next week! Edited by joev14, Sep 06 2014 - 08:15 PM. 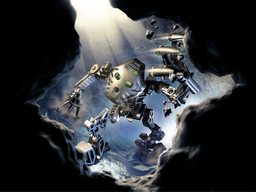 VakamaMetruNui will be voicing Turaga Whenua (As well as Whenua Metru in the future), and Onepu! Casting for Book 1 is finished, I will be posting casting for book 2 soon! Trailer is great! Can't wait to see, or rather hear, what the first chapter is gonna be like! Oh this is going to be so awesome! The voices are perfect! I can't wait to hear the audiobook. when is the first book estimated to release? We'll be releasing them chapter-by-chapter. Recording has begun, but we haven't got any dates quite yet. Although, we hope to have the first book finished by the end of September. Wow. I love this. All of the voices in the trailer seemed so perfect. I'm looking forward to seeing what you guys make. Also, question: does Kopeke come into the books, at all? Hmm? Why do I ask? Oh, no reason. No reason at all. An ambitious project to be sure. I wish you all the luck in the world and look forward to seeing the results. Are you going to be going through the books by release date then? No surprise whatsoever that Eljay has a hand in this as Lewa. I'd also like to say that the voices lined up for Pohatu, Kopaka, and Gali are fantastic. Pretty much spot on with my head canon (although sometimes Kopaka did sound more like Steve Blum in my head...). My only concern is what seem to be some obvious issues with the playback quality. Granted, not everyone can afford a studio-level microphone, but I imagine something could probably be done in Audacity or somesuch to clean it up a bit. Honestly, I'd be very interested in playing a part in all this. I just worry about having the time to do it in between school (that and what happens when one of the characters winds up with a MN accent? ). So.. like, this isn't violating any kind of copyright policy? I'll be keeping an eye on this for sure then! EDIT: Ok, Makuta's voice just sent me the chills! Awesome work on that Skullkid! The Toa voices also sound great. This is going to a very good quality project. Edited by Tattorack, Sep 16 2014 - 09:14 AM. "Because it submerges in a marine enviroment I'm going to call it a safely-go-under-the -water-without-detection device"
I will be keeping an eye on this project. I think it's a fantastic undertaking and I can't wait to read along. That Makuta voice is spot on. I'd like to hear Onua's voice reading a more normal line though. He has a very short number of lines in Downfall. Feel free to shoot me a PM if you're interested in voicing him! So long as we're not making money from it, I believe we are in the clear in terms of copyright laws. (Especially because the books are not being produced anymore). You'll get a chance to hear Grey in action in Chapter 3! Sounds like an awesome project! I will definitely be following this, and hopefully I can help with this somehow. Looking forward to seeing your available parts for book 2! I voice Onua, and trust me, I don't like the trailer line either, but I can see why we used it. But yeah, it's a legit line from the book and makes sense in context. But yeah, it's a legit line from the book and makes sense in context. XD Seriously? From what one? Hmm, I might just do that. Chronicles 1. He meets Onepu and tries to speak that way to him, thinking he might not speak the same language. Can you use effects? Or does it just have to be voice talent? It depends. What effects are you thinking of providing? 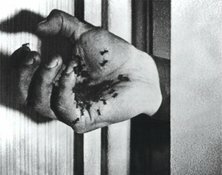 If you're considering using any sound effects at all in the narrations, I might be of some help with that as well - especially if there's any SFX from the films that you would want. Edited by TheSkeletonMan939, Sep 16 2014 - 01:56 PM. An electronic type effect. Something that sounds like it's coming from a robot (I'm planning on auditioning for a Bohrok-Kal ). Dang I'm torn on whether I should consider signing up for this or not. On the one hand this does seem really cool and interesting, on the other I got college and work. Oh choices. That's not how copyright works. Though the internet as a whole seems to have this mentality that copyright only applies to money-making circumstances, it is incorrect. To site the books themselves (well, City of the Lost anyway; too lazy to find my books atm): "No part of this publication may be reproduced, stored in a retrieval system, or transmitted in any form, or by any means, electronic, mechanical, photocopying, recording, or otherwise, without written permission of the publisher." Though, to be fair, I wouldn't expect Scholastic to pursue copyright infringement on an out-of-print book that's not coming back into the print unless Bionicle gets VERY popular in the next few years. Edited by Lewa Krom, Sep 16 2014 - 03:35 PM. Yah, college is a downer when it comes to projects like this. If it helps, Joev is very good at working around our schedules. Not to mention, their are small parts that will need to be filled! That's good, hopefully I won't fall behind on homework. Figuring out who to voice is another matter though. If we don't have the books, will you supply us with the text? Also, will you do the movie books as well? If so, I'd really like to voice Takanuva/Takua whatever. Edited by Player1, Sep 16 2014 - 11:05 PM.